Structure, evolution and functional inference on the Mildew Locus O (MLO) gene family in three cultivated Cucurbitaceae spp. The powdery mildew disease affects thousands of plant species and arguably represents the major fungal threat for many Cucurbitaceae crops, including melon (Cucumis melo L.), watermelon (Citrullus lanatus L.) and zucchini (Cucurbita pepo L.). Several studies revealed that specific members of the Mildew Locus O (MLO) gene family act as powdery mildew susceptibility factors. Indeed, their inactivation, as the result of gene knock-out or knock-down, is associated with a peculiar form of resistance, referred to as mlo resistance. We exploited recently available genomic information to provide a comprehensive overview of the MLO gene family in Cucurbitaceae. We report the identification of 16 MLO homologs in C. melo, 14 in C. lanatus and 18 in C. pepo genomes. Bioinformatic treatment of data allowed phylogenetic inference and the prediction of several ortholog pairs and groups. Comparison with functionally characterized MLO genes and, in C. lanatus, gene expression analysis, resulted in the detection of candidate powdery mildew susceptibility factors. We identified a series of conserved amino acid residues and motifs that are likely to play a major role for the function of MLO proteins. Finally, we performed a codon-based evolutionary analysis indicating a general high level of purifying selection in the three Cucurbitaceae MLO gene families, and the occurrence of regions under diversifying selection in candidate susceptibility factors. Results of this study may help to address further biological questions concerning the evolution and function of MLO genes. Moreover, data reported here could be conveniently used by breeding research, aiming to select powdery mildew resistant cultivars in Cucurbitaceae. The Mildew Locus O (MLO) gene family encodes for plant-specific proteins structurally related to metazoan G-protein coupled receptors (GPCRs), harbouring seven transmembrane domains and a calmodulin-binding domain that is likely implicated in the perception of calcium-dependent stimuli [1, 2]. Genome-wide studies characterized a number of homologs varying from 12 to 19 in the MLO gene families of Arabidopsis, grapevine, rice, peach, woodland strawberry and tobacco [1, 3–6]. Specific MLO homologs act as susceptibility factors towards fungi causing the powdery mildew (PM) disease, affecting thousands of plant species and representing a major threat in many agricultural settings . Indeed, their inactivation, resulting from gene knock-out or knock-down, leads to a peculiar form of resistance, referred to as mlo resistance, based on the enhancement of pre-penetrative defence responses [2, 8, 9]. mlo resistance was first reported to occur in barley, following of loss-of-function mutations of the HvMLO gene . More recently, knocking-out or knocking-down of specific MLO genes was shown to lead to PM resistance in several other plant species, namely Arabidopsis, tomato, pea, pepper and wheat [11–16]. Pleiotropic effects associated with mlo resistance do not seem so severe to compromise its practical exploitation [9, 17]. Therefore, it has been suggested to selectively target MLO genes of cultivated species as a general breeding strategy against PM . In contrast with other kind of immunities, such as those conferred by plant resistance genes (R-genes), a body of evidence indicates that mlo resistance is characterized by broad-spectrum effectiveness and durability. For example, barley mlo resistance is effective against all known isolates of the PM fungus Blumeria graminis f. sp. hordei, and is successfully employed in barley cultivars since 1979 . Similarly, pea er1 PM resistance, due to loss of function mutations of the PsMLO1 gene, was first reported in 1948 and is the only resistance source worldwide used for breeding purposes [19, 20]. Previous phylogenetic studies grouped MLO proteins in six clades . Available scientific literature indicates that the clades referred to as IV and V, displaying peculiar molecular features, include a few homologs playing a major role in PM susceptibility in monocots and dicots, respectively [21, 22]. Moreover, corresponding MLO genes are strongly upregulated upon challenge with PM fungi (e.g. [5, 12, 13]. Taken together, this body of evidence indicates that phylogenetic inference, multiple alignment and gene expression studies are all important tools to identify, across cultivated species, novel MLO homologs determining the outcome of the interaction with PM fungi. PM caused by the fungal species Golovinomyces cichoracearum and Podosphaera xanthii is considered to be one of the main biotic threat for the cultivation of species of the Cucurbitaceae family [23–26]. Melon (Cucumis melo L.), watermelon (Citrullus lanatus L.) and zucchini (Cucurbita pepo L.) are three important horticultural Cucurbitaceae species, grown throughout the world and of great interest for nutritional properties as well as for economic importance. Recently, genome sequence of these three species was released [27, 28], (https://cucurbigene.upv.es/genome-v3.2/). Several putative disease resistance genes were identified in the melon genome. Among them, 15 genes were classified as transmembrane receptors and found to be homologous to barley HvMLO . No member of the watermelon and zucchini MLO gene families was isolated so far. Here, we used melon, watermelon and zucchini genomic resources to characterize the corresponding MLO gene families, and gain information with respect to their structure, evolutionary history and function. Among other things, this could result extremely useful for practical breeding activities aiming to select PM resistant cultivars in these species. In order to identify MLO proteins in melon, a BLASTp analysis against the publicly available genomic database of C.melo was performed. This yielded 20 significant matches, each corresponding to a MLO-like hit. Two of the newly identified CmMLO proteins (named MELO3C022486 and MELO3C000169 in the database) resulted to be identical to different regions of the melon homolog CmMLO1, previously characterized . We decided to discard these sequences and keep the corresponding CmMLO1 gene for further analysis since its sequence and expression was experimentally validated by Cheng et al. . CmMLO genes corresponding to the newly identified proteins were named from CmMLO2 to CmMLO16 (Table 1). Database search revealed the occurrence of additional splicing variants for the C. melo homologs CmMLO5, CmMLO8 and CmMLO10 (Table 1). With the exception of CmMLO9, chromosomal localizations of CmMLO genes were inferred based on the presence, on the same scaffold, of single nucleotide polymorphism (SNP) markers mapped to melon linkage groups  (Additional file 1). Predicted intron/exon structure and corresponding protein amino acid length were also obtained by database search (Table 1). A similar in silico approach allowed the identification of members of the MLO protein family in C. lanatus. BLASTp of melon MLO protein sequences against the Cucurbit genomics database resulted in the identification of 14 significant matches annotated as MLO-like proteins. Corresponding genes were named from ClMLO1 to ClMLO14. For all of them, it was possible to determine chromosomal localization and intron/exon boundaries (Table 2, Additional file 1). Cucurbita pepo homologs harbouring a typical MLO domain were identified by using an in-house-built pipeline described in the materials and methods section. These were designated sequentially from CpMLO1 to CpMLO18 based on the length of their putatively encoded protein (Table 3). Localization of the corresponding genes on C. pepo scaffolds was predicted by means of data available at the Cucurbigene genomic database (Table 3). The MLO-Pfam domain of C. melo, C. lanatus and C. pepo MLO proteins was used to infer phylogenetic distances between them and with respect to MLO homologs of other plant species (Fig. 1). In total, 61 MLO proteins (pairwise average identity: 38.3 %) collapsed in six phylogenetic clades (bootstrap index ≥78) (Fig. 1). These were designated with the Roman numerals from I to VI, based on the position of Arabidopsis and monocot MLO homologs, according to the previous study of . Strong bootstrap support was found for the presence of a common ancestor in the evolutionary history of clades I and II (Fig. 1). Clade I includes 12 MLO proteins, three of which are annotated in Arabidopsis (AtMLO4, AtMLO11 and AtMLO14), four in C. melo (CmMLO7, CmMLO8, CmMLO9 and CmMLO10), four in C. lanatus (ClMLO6, ClMLO9, ClMLO10 and ClMLO14) and one in C. pepo (CpMLO15). Clade II groups eight MLO homologs, annotated in Arabidopsis (AtMLO1, AtMLO13 and AtMLO15), C. melo (CmMLO1 and CmMLO11), C. lanatus (ClMLO4) and C. pepo (CpMLO3 and CpMLO14). Phylogenetic data also provided evidence for a common ancestor originating clades III and IV (Fig. 1). Clade III includes nine Cucurbitaceae homologs (CmMLO4, CmMLO6, CmMLO13, CpMLO11, CpMLO17, CpMLO18, ClMLO7, CmMLO11, and ClMLO13) together with five Arabidopsis proteins (AtMLO5, AtMLO7, AtMLO8, AtMLO9 and AtMLO10). Clade IV contains MLO proteins from monocot species only. Three melon (CmMLO3, CmMLO5 and CmMLO12), four zucchini (CpMLO9, CpMLO10, CpMLO13 and CpMLO16) and five watermelon proteins (ClMLO1, ClMLO2, ClMLO5, ClMLO8 and ClMLO12) cluster together in the phylogenetic clade V, including all the dicot MLO homologs experimentally shown to act as PM susceptibility factors [11–15]. Finally, clade VI is located on an ancestral position, lacking C. melo homologs and harbouring only three proteins (AtMLO3, ClMLO3 and CpMLO12). A further phylogenetic analysis was performed using nucleotide sequences (including introns) of the C. melo, C. lanatus and C. pepo gene families (Additional file 2). This did not provide clear evidence of recent gene duplication events, as the rate of nucleotide identity of monophyletic MLO pairs resulted to be very low. For each of the three species, the highest levels of pairwise nucleotide identity concern the pairs CmMLO4-CmMLO6 (49.8 %), ClMLO9-ClMLO14 (47 %) and CpMLO3-CpMLO14 (62.7 %) (Additional file 2). Phylogenetic analysis supported the identification of five putative ortholog pairs (OP1-OP5; bootstrap index ≥99) and seven putative ortholog groups (OG1-OG7; bootstrap value ≥70) including C. melo, C. lanatus and C. pepo MLO homologs (Fig. 1). 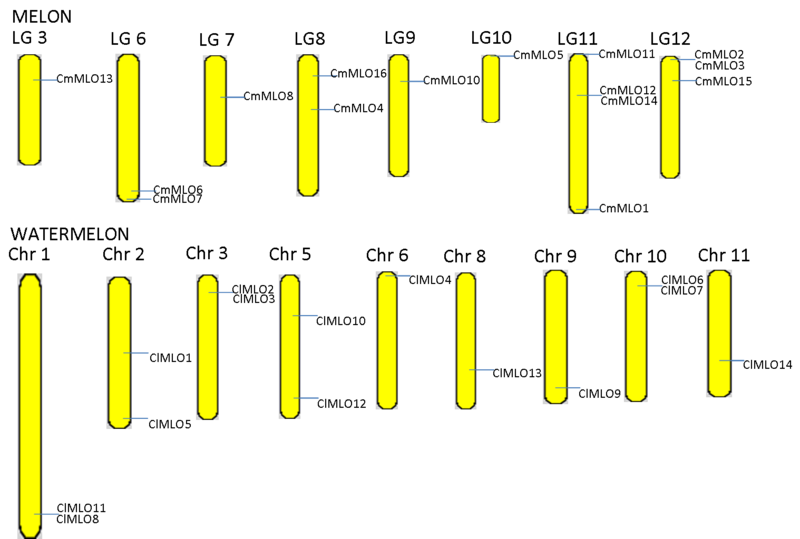 The putative ortholog groups 2, 3 and 7 included three C. pepo paralog pairs, CpMLO3-CpMLO14, CpMLO11-CpMLO17 and CpMLO10-CpMLO13, respectively (bootstrap value ≥87). In order to provide further evidence for the identification of Cucurbitaceae orthologs, we performed multiple genome alignments of C. melo, C. lanatus and C. pepo genomic regions harbouring MLO genes. We reasoned that, in case of orthology, these regions, sharing a common ancestry, would have displayed high level of syntheny. Remarkably, all the MLO homologs clustering in the same ortholog group or pair were found to be located in syntenic genomic regions (Fig. 2, Additional file 3, 4, 5 and 6), thus substantiating the predictions resulting from the phylogenetic study. To examine sequence features of melon, watermelon and zucchini MLO proteins, a full-length multiple sequence alignment of 48 Cucurbitaceae proteins was performed. For comparative purposes, we completed the dataset with 12 MLO proteins from 10 different plant species (Solanum lycopersicum, Capsicum annum, Nicotiana tabacum, Medicago truncatula, Pisum sativum, Arabidopsis thaliana, Lotus japonicus, Triticum aestivum, Hordeum vulgare and Oryza sativa), known to play a major role in the interaction with PM fungi. Aligned regions of the Cucurbitaceae MLO homologs showed very high conservation levels (>95 %) with respect to the 30 amino acid residues previously indicated as invariable throughout the whole MLO protein family  (Additional file 7). Moreover, we found other 13 residues highly conserved (>95 %) in the Cucurbitaceae MLO families as well as in the other MLO homologs used for multiple alignment. These are distributed in the extracellular N-terminal region (T83), the 1st intracellular loop (T85,W86, A89and V91), the 2nd transmembrane domain (L162, K168, K170 and L181), the 1st extracellular loop (P219), the 2nd intracellular loop (K339 and W347) and the 3rd intracellular loop (D594) (Additional file 7). Analysis of MLO proteins belonging to clade V revealed the presence of 125 conserved (>90 %) residues in common between Cucurbitaceae and other species (Additional file 7), thus indicating they could specifically play a role in the response to PM fungi. Moreover, 25 patterns of consecutive conserved amino acids (motifs), distributed along all the known domains of MLO proteins and ranging in size from 2 to 11 residues, were identified (Additional file 7). The dissimilarity level between the non-synonymous substitution (dN) and synonymous substitution (dS) values was used to infer the direction and magnitude of natural selection acting on MLO genes in C. melo, C. lanatus and C. pepo. Neutrality tests, performed on the MLO gene family of each of the three Cucurbitaceae species, yielded average δ (dN-dS) and ω (dN/dS) values ranging from −23.89 to −17.58 and from 0.29 to 0.41, respectively (Table 4). This indicates that negative selection has been acting against extreme polymorphic variants. In particular, the MLO families of C. lanatus and C. melo, whose members have average sequences identity of 42.6 % and 46.8 %, respectively, appear to be subjected to very high negative selection pressures (δ = −23.89; ω = 0.31 and δ = −22.92; ω = 0.29). The C. pepo MLO family, including members with average identity of 33.4 %, is characterized by a softer level of negative selection (δ = −17.54; ω = 0.41). Single codon analysis highlighted the presence of 36, 134 and 127 negatively selected sites in the C. pepo, C. lanatus and C. melo MLO families, respectively. With respect to other phylogenetic clades, clade V displays lower δ (−27.73) and ω (0.27) values (Table 4), thus suggesting that it is subjected to a larger number of selective constraints. Interestingly, single codon evolutionary analysis of clade V homologs also revealed the presence of three protein regions, located in the 1st transmembrane domain, the 1st extracellular loop and the intracellular C-terminus domain, harbouring several residues predicted to be under positive selection pressure. Despite the low number of sequences used for the analysis, one of them (in position 252 of the alignment in Additional file 7) is characterized by a p-value <0.1 (considered to be a stringent significant threshold for single likelihood ancestor counting (SLAC) evolutionary analysis) (Fig. 3). In order to validate this finding, we analysed the direction and magnitude of natural selection acting on the Rosaceae clade V MLO homologs reported by . Notably, this resulted in the identification of several codons characterized by high dN-dS values and encoding for residues also positioned in the protein 1st transmembrane domain, 1st extracellular loop and intracellular C-terminus (Fig. 4). A distinctive feature of MLO susceptibility genes is their up-regulation upon PM challenge. Therefore, we quantified relative expression levels of clade V watermelon MLO genes (ClMLO1, ClMLO2, ClMLO5, ClMLO8 and ClMLO12) in leaves artificially inoculated with the PM fungus Podosphaera xanthii and in non-inoculated controls. No significant difference was detected for ClMLO1, ClMLO2, ClMLO5 and ClMLO8. Notably, strong up-regulations was observed for ClMLO12 at the time points corresponding to 9 and 24 h after inoculation, indicating that it is a pathogen-responsive gene (Fig. 5). In this study, we exploited available genomic resources to characterize the MLO gene family in cultivated Cucurbitaceae. A total of 16, 14 and 18 MLO-like gene sequences were identified in the genomes of C. melo, C. lanatus and C. pepo, respectively. This is consistent with the results of previous genome-wide surveys, reporting the presence of a number of MLO homologs variable from 15 and 19 [1, 3, 5, 6]. All the predicted C. lanatus MLO proteins resulted to have amino acid lengths comparable to those of Arabidopsis AtMLO homologs, ranging from 460 to 593 residues . In contrast, predicted length of some of the C. melo and C. pepo MLO homologs resulted be markedly shorter or, in one case, longer than these limits (Tables 1, 2 and 3), possibly due to incorrect prediction. Information on chromosome/scaffold localization of C. melo and C. lanatus MLO homologs revealed that most of them occur as singletons, thus indicating they have been mainly originated by segmental duplication events. This is consistent with previous investigations on the evolution of the MLO gene family in Rosaceae species and in soybean [5, 31]. Nonetheless, for each of the two species, three pairs of physically close homologs were found (CmMLO2-3, CmMLO6-7, CmMLO12-14, ClMLO2-3, ClMLO6-7, ClMLO8-11) (Additional file 1), which are likely the result of tandem duplication. None of the duplication event in the C. pepo, C. lanatus and C. melo genomes appeared to have occurred recently, as resulting from the computational analysis performed in this work indicating a low rate of nucleotide identity between monophyletic MLO pairs (Additional file 2). Relations of orthology between Cucurbitaceae MLO homologs were inferred based on both phylogenetic relatedness and localization in microsynthenic regions. This resulted in the prediction of five ortholog pairs and seven ortholog groups (Fig. 1). Importantly, in support of our conclusions, all the C. lanatus/C. melo ortholog pairs predicted in this study are positioned in macrosynthenic genomic regions between the two species, described by Guo et al. (Additional file 8). In three cases, ortholog groups were found to contain 2 homologs from C. pepo (Fig. 1). Possibly, these might represent co-orthologs relative to C. melo and C. lanatus proteins falling in the same group, which originated from duplication during the evolutionary history of C. pepo genome. Phylogenetic analysis allowed to assign Cucurbitaceae MLO proteins to the five evolutionary clades previously reported to include homologs from dicotyledonous species (Fig. 1). Three melon, three watermelon and four zucchini MLO homologs were found to cluster together in the phylogenetic clade V, containing all the dicot isoforms functionally associated with PM susceptibility. Moreover, we demonstrated that watermelon ClMLO12 is up-regulated during pathogenesis, a feature which is shared by other PM susceptibility factors (e.g. [5, 12, 13]). Thus, with our study we provide information on targets of future activities addressed to the inactivation of PM susceptibility genes and, thus, the selection of resistant genotypes. Several approaches of reverse genetics are available to breeders interested in MLO gene knock-out or knock down, such as those based on RNA interference (RNAi), targeted induced local lesions in genomes (TILLING), transcription activator-like effector nucleases (TALEN), zinc finger nucleases (ZFNs) and clustered regularly interspaced short palindromic repeat (CRISPR) technology [32–34]. Noteworthy, TALEN and CRISPR technology have been recently successfully used to introduce mlo resistance in bread wheat, as reported by Wang et al. .
We performed a multiple alignment of a large dataset MLO proteins, aiming to detect amino acid residues and motifs that, being highly conserved, are predicted to play a major role for protein function. As expected, a very high conservation level was found with respect to the 30 amino acids previously shown to be invariable in a panel of 38 selected MLO sequences . In addition, we detected other 13 highly conserved residues (Additional file 7). Alignment, restricted to isoforms known to act as PM susceptibility factors and clade V Cucurbitaceae MLO homologs, also revealed a series of conserved amino acid residues and motifs scattered in several protein domains (Additional file 7). These might be specifically important for the function of isoforms associated with PM susceptibility. With this respect, our study complements the previous work of Panstruga , reporting the identification, in the MLO protein first extracellular region, second and third intracellular regions and the cytoplasmic C-terminus, of a series of amino acids specifically conserved in putative orthologs of barley HvMLO. In line with the identification of several conserved residues, tests addressed to infer evolutionary forces acting on Cucurbitaceae MLO homologs suggested a general high level of negative selection (Table 4), thus pointing to the presence of a series of constraints required for protein function. Interestingly, single codon analysis of Clade V Cucurbitaceae and Rosaceae MLO homologs also highlighted the occurrence of three protein regions that are likely under positive selection pressure (Fig. 3 and 4). Positive selection is a common phenomenon which drives plant/pathogen co-evolution, in accordance to an “arms race” model . For example, positive selection been shown to occur for solvent-exposed residues of plant resistance (R) genes, as it provides an advantage in pathogen recognition . It might be tempting to speculate that positively selected MLO residues located in the first extracellular loop or in the intracellular C-terminus might also be implicated in pathogen sensing. However, the role of MLO proteins in the interaction with PM fungi is still elusive to date, and no molecular interaction between MLO proteins and pathogen effectors has been reported so far. In the present study, we carried out a genome-wide characterization of the MLO gene families in three economically important Cucurbitaceae species. Importantly, our results also lay a foundation for future breeding activities aimed at introducing PM resistance. In order to retrieve predicted melon MLO genes and MLO proteins, a BLASTp search (e-value < 1e-5) was carried out against the CM3.5.MELO.3C protein repositories publicly available at the Melonomics melon genomic database (https://melonomics.net). Homologs were assigned to melon linkage groups based on the reference map position of SNP markers belonging to the same scaffold. Watermelon MLO-like protein sequences were isolated by blasting each of the 18 melon protein sequences against the watermelon_v1.pep repository available at the Cucurbit Genomic Database (http://www.icugi.org/cgi-bin/ICuGI/index.cgi). Information on chromosomal localization of each of the corresponding genes was available at the same database. Aiming to the characterization of the MLO gene family in zucchini, a bioinformatic pipeline was developed in house. We used available Cucurbita pepo unigenes (http://www.icugi.org/cgi-bin/ICuGI/misc/download.cgi) for a BLASTn analysis against C. pepo scaffolds (https://cucurbigene.upv.es/genome-v3.2/), in order to discover C. pepo scaffolds harbouring MLO loci. A subsequent MLO prediction on C. pepo candidate scaffolds led to the identification of 18 MLO genes. Cds and encoded sequences of zucchini MLOs were predicted using the GeneScan software (http://genes.mit.edu/GENSCAN.html). Sequence similarities were determined performing a MUSCLE (multiple sequence comparison by log- expectation) multiple alignment  using the conserved MLO domain sequence of the PFAM database (ID: PF03094) as input. For the three melon MLO homologs for which two transcripts were identified in database, the longest was used for the analysis. Phylogenetic analysis was performed by using newly identified Cucurbitaceae MLO homologs containing at least 50 % of the full-length MLO domain (12 from C. melo, 14 from C. lanatus and 11 from C. pepo). The dataset was completed with the whole Arabidopsis MLO protein family and the following proteins previously shown to act as PM susceptibility factors: pea PsMLO1, barley HvMLO, rice OsMLO2, pepper CaMLO2, tomato SlMLO1, barrel clover MtMLO1, lotus LjMLO1, and wheat TaMLO1_A1b and TaMLO_B1. All of these sequences were extracted from the NCBI database (http://www.ncbi.nlm.nih.gov). Evolutionary relationships between MLO proteins were inferred using the maximum likelihood method based on the Whelan and Goldman model , using the MEGA6 software (http://www.megasoftware.net) . The bootstrap consensus tree, obtained from 100 replicates, was taken to represent the MLO family phylogenetic history . To the characterization of conserved amino acids and motifs a full-length multiple alignment was conducted using the 48 Cucurbitaceae MLO proteins identified in this study and 12 reference MLO proteins characterized in other species (Additional file 4). Evolutionary forces acting on MLO homologs, in Cucurbitaceae and Rosaceae families, were investigated by determining two parameters based on the number of non synonymous and synonymous substitutions per non synonymous and synonymous site (dN and dS, respectively), indicated as δ (dN-dS) and ω (dN/dS). Tests were conducted to estimate the evolution of each codon: positive (dN > dS); neutral (dN = dS); and negative (dN < dS). The variance of the difference was computed using the bootstrap method (1000 replicates). Analyses were conducted using the Nei-Gojobori method  implemented in the MEGA6 software . All MLO coding DNA sequences were aligned using ClustalW 1.74  and positions with less than 80 % site coverage were eliminated from the analysis. To clearly depict the proportion of sites under selection, an evolutionary fingerprint analysis was carried out using the implemented SLAC algorithm in the Datamonkey server at the default value . Pressure selection analysis were performed on the same sequences subset of phylogenetic analysis. Relationships of orthology between Cucurbitaceae MLO genes were inferred based on phylogenetic distance. Furthermore, synthenic chromosomal regions containing putative MLO orthologs were searched in the genomes of melon, watermelon and zucchini by using the MAUVE (Multiple Alignment of Conserved Genomic Sequence with Rearrangements) software package . To determine a reasonable value for the Min Locally Collinear Blocks (LCBs), we performed an initial alignment at the default value and then used the LCB weight slider in the MAUVE graphical user interface (GUI) to fix parameters empirically eliminating all spurious rearrangements. Sequences were then realigned using the manually determined weight value. To identify duplicated homolog pairs in the C. melo, C. lanatus and C. pepo MLO gene families, we run a phylogenetic analysis using nucleotide sequences (including introns), using the Maximum Likelihood method and applying General Time Reversible model. We defined a gene duplication according to the following criteria: (1) clade bootstrap index >70, (2) alignable nucleotide sequence identity ≥70 % (3) putative recent duplications were also filtered for physical chromosome/scaffold co-localization and (4) only one event of duplication is counted for tightly linked genes. The alignments of these dataset were conducted using ClustalW 1.74 . These criteria are described by Andolfo et al. .
Plants of C. lanatus cv. Sugar Baby were kindly provided by the Semiorto Sementi Seed Company (Sarno, Italy). Inoculation with PM fungus was performed on the third true leaf of 10 cm high plants, by touching with heavily sporulating leaves of spontaneous infected C. lanatus cv. Sugar Baby. Leaf samples were collected 5, 9 and 24 h after artificial inoculation with PM fungus Podosphaera xantii. Plants touched with healthy leaves at the same time points were used as controls. For each treatment, four biological replicates were sampled. Total RNA was isolated from ground, frozen leaf tissues using the SpectrumTM Plant Total RNA Kit (Sigma-Aldirch). A complete removal of traces of DNA was performed using On-Column DNase I Digest Set (Sigma-Aldirch). RNA quantity and quality were measured spectrophotometrically by the NanoDrop ND-1000 Spectrophotometer (NanoDrop Technologies) and on a denaturing formaldehyde gel. Reverse transcription was performed in a volume of 20 μl using the SuperScript III Reverse Transcriptase kit (Invitrogen) with oligo-dT primers. Resulting cDNAs were diluted (1:20) with autoclaved distilled water and stored at −20 °C until further analysis. The expression of of MLO genes grouping in the phylogenetic clade V (CmMLO1, CmMLO2, CmMLO5, CmMLO8 and CmMLO12) was monitored through qRT-PCR; using the 7900HT Fast RealTime PCR System (Applied Biosystems). Reactions were prepared in a total volume of 12 μL with 6 μL of the 2X SensiFAST™ Probe Hi-ROX Kit (Bioline), 0.4 pmol of target gene primers (Additional file 6) and 4 μL of cDNA template. PCR cycling conditions were as follows: 95 °C for 10 min, followed by 40 cycles of two steps: 95 °C for 15 s and 60 °C for 1 min. A dissociation kinetics analysis was performed after each assay in order to check the specificity of the amplification products. The melting curve programme was set from 60 °C to 95 °C with a 2 % heating rate and a continuous fluorescence measurement. For each time point, relative quantification of gene expression was carried out using the 2−ΔΔCt method  with respect to the untreated control sample (calibrator). Primers designed on the housekeeping gene β-Actin (Additional file 9) were used for normalization of the expression levels of the target gene, as it was reported to as a suitable housekeeping by Kong et al. . The Student's t-test was used in statistical data analysis procedure for hypothesis testing. All the supporting data is included within the article (and its additional files). Paolo Iovieno and Giuseppe Andolfo are joint first authors. This work was supported by the Ministry of University and Research (GenHORT project). We acknowledge the Cucurbigene team for giving us the permission to publish data relative to the C. pepo genome. PI, GA, SP, MRE, LF and LR conceived the study and designed the experiments. PI, GA, AS, SP, DC were involved in performing the experiments and interpretation of data. SP, PI, GA, GS were involved in manuscript writing. All the authors read and approved the final manuscript. Lebeda A, McGrath MT, Sedlakova B. Fungicide resistance in Cucurbit Powdery mildew fungi In: Odile Carisse, editor. Fungicide. InTech Publisher; 2010. p. 221–246. ISBN: 978-953-307-266-1. doi:. Available from: http://www.intechopen.com/books/fungicides/fungicide-resistance-incucurbit-powdery-mildew-fungi.